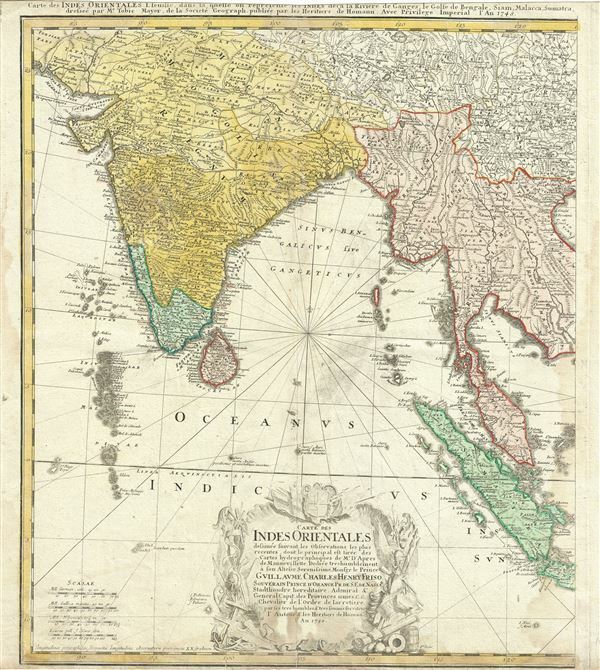 This is an attractive example of the western sheet of the Homann Heirs' 1748 map of India and Southeast Asia. It details the subcontinent as well as much of Southeast Asia, including modern day Burma, Thailand, Laos, Malaysia, Singapore and Sumatra. Extends north to include Delhi (Delly) and Agra as well as parts of Tibet. The apocryphal Lake of Chiamay, a cartographic error common in many early maps of this region, appears in vestigial form near Assam. This map was drawn by Tobias Meyer for the Homann Heirs in 1748. Very good. Original platemark visible. Minor wear along original fold lines. Some dampstains near left and right margin, and over tittle. Narrow top and bottom margins. Blank on verso.